Do you like a good traditional pound cake recipe and inspired Southern cuisine? Do you like a novel with Southern charm (and that Southern Gothic element as well)? What about a good quirky character ensemble? 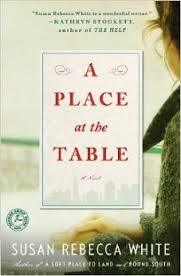 Susan Rebecca White's novel, A Place at the Table, combines all of these elements. The novel's prologue describes a disturbing scene in Emancipation, North Carolina during the late 20s, but the bulk of the novel takes place during the 80s and 90s in Georgia, Connecticut and New York City. How does a character from an era of lynchings and fear intertwine with more modern characters trying to make their way in NYC? You will enjoy finding out the answer and following the three main characters of Alice, Bobby, and Amelia as they all make their way to find peace with themselves and the world around them. I, however, will be waiting for a "replacement" copy of this novel. I originally bought this novel on a bargain rack somewhere, read the majority of it and decided that I had to choose it for a CTB selection. Then, guests were coming for Thanksgiving, we decided to recarpet a guest bedroom, and I had to move all my books from one room to another. I promptly lost my copy in the black hole that is my "library." I ordered a replacement used copy that should be arriving any day so I can finish A Place at the Table and find out the answers to the above questions as well. Anyone is welcome to join in. Simply create a dish inspired by the book and post about it. Then, email me (eliotseats@gmail.com) on or before January 31, 2016. Please include your name, your blog's name, the name of your dish and a photo (or allow me to pull a photo from your website). I put my order in at the library. Looking forward to it. Thanks Debra. I ordered it, according to my Amazon order list, back in August. Now I just need to find it. We boxed up an entire shelf of books to get out of the way during our remodel. Oye. Camilla---If I find my original copy, I will ship it to you. Oye, indeed! I enjoyed the novel: thanks Debra!